Sending Hugs & Kisses! A Penny Black card! I am so thrilled to find time to craft today. This precious craft time was so hard to get for past month and a half. Life threw a curve ball at me. So many unexpected things piled up and sorting them out took all the time. No time or energy to craft. Now most of stuff is sorted and settled. There is a routine to the madness now. So relieved Yay! I am sharing a card today with you which is totally out of my comfort zone. This style is not my style, however this was my style when I did scrapbooking layouts. Although I was nerves doing this card, it was not hard once I got started. Here is the card for you. There are a lot of dies from Penny Black using on this card. 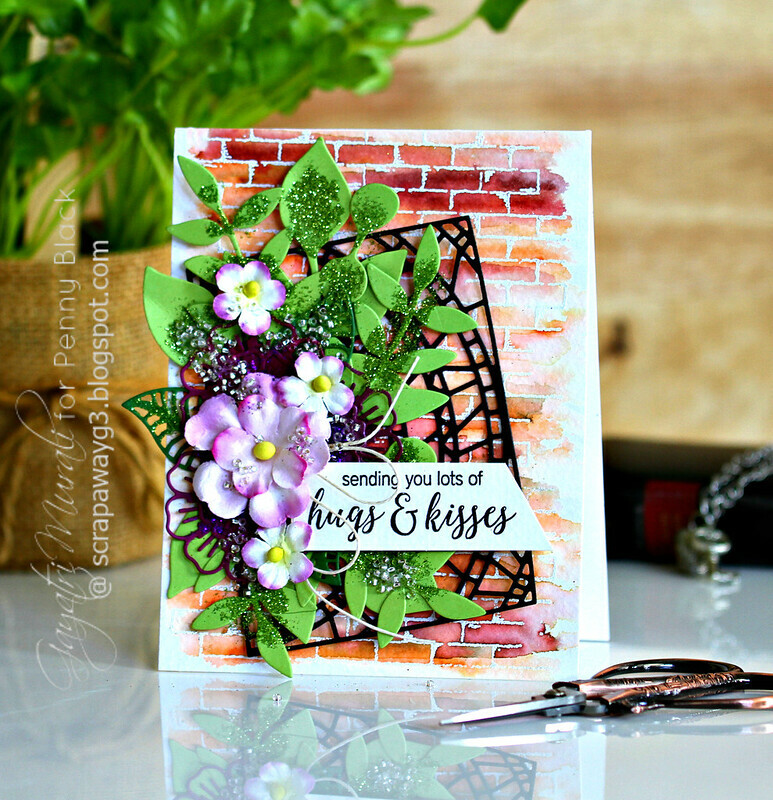 The background is also created using Penny Black cling stamp set called Brick Wall. I white heat embossed the stamp set and watercoloured with brown watercolours. 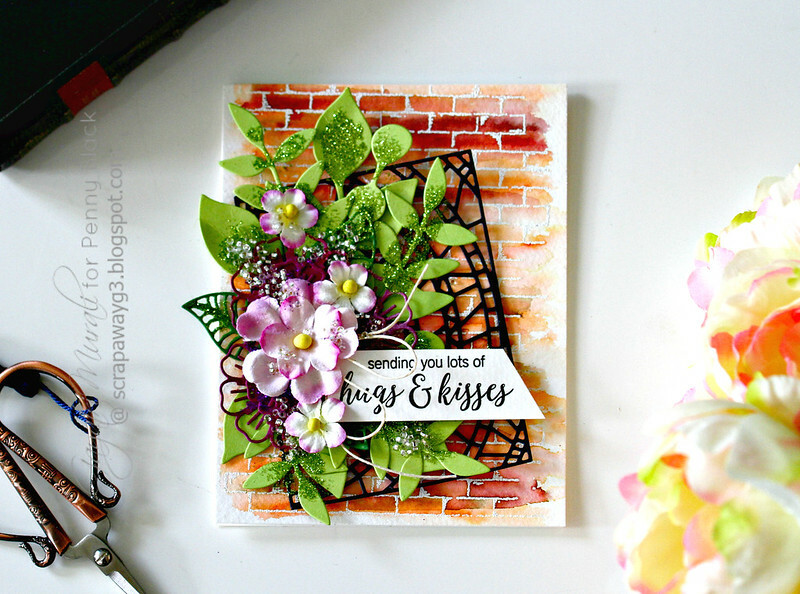 Over this background, I layered with a black Half Circle die cut also from Penny Black. I adhered this die cut at an angle for added interest. Then I layered with lots of leaves die cut using Penny Black Leaves dies. 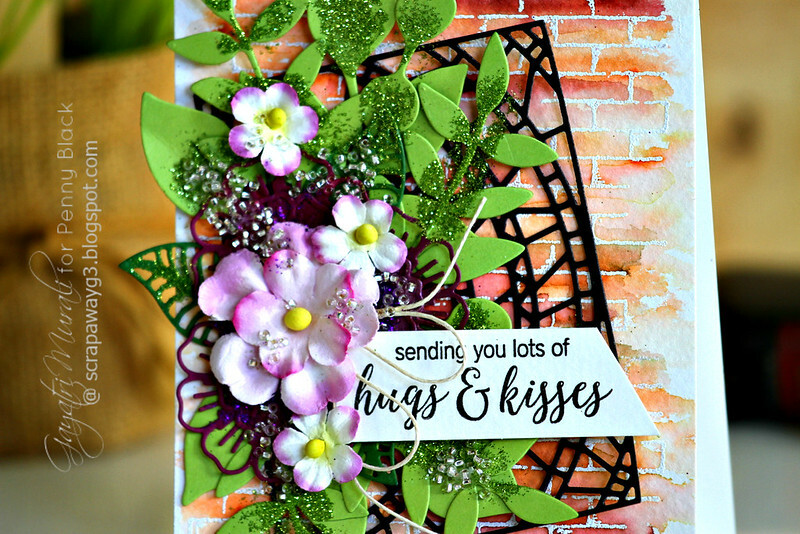 On top of these leaves, I layered three flowers and leaves die cut using Penny Black Layered Flowers. At this stage, I added purple and green glitter using Multi Medium Matt. Finally, I added some flowers from Prima Marketing, a twine bow and lots and lots of Silver Shimmer Seed Beads from Pretty Pink Posh. The sentiment is from Penny Black Special Thoughts stamp set. There is a lot of layering on this card. I love how it turned out. So pretty. I still want to learn how to work the randomness of the glitter or microbeads. Normally it is microbeads that are used to add texture to the flowers. I don’t have any and hence my alternative was Seed Beads. It worked too. Here is a closeup of the card. Hope you like my card. All the Penny Black products and new releases are now available for purchase from the Penny Black Store. Wow!! Such a beautiful card!! Love the brick background!! The flowers are beautiful!! WOW Gayatri. This is really stunning. I LOVE this style but struggle with it. You've done a superb job of this one. Love your card! Great job.